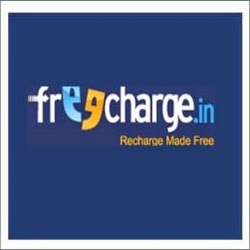 FreeCharge.in is an e-commerce website headquartered in Mumbai, Maharashtra. It provides online facility to recharge any prepaid mobile phone, postpaid mobile, DTH & data card in India. They are offering 40 Rs. free coupon codes free just after doing a small recharge from their website. Follow the steps to get your 40 Rs. coupon codes. Note: As this trick is no more working, Click here for working trick! Note: Not working now. Please refer our new posts! 1. Go to FreeCharge.in website. 2. 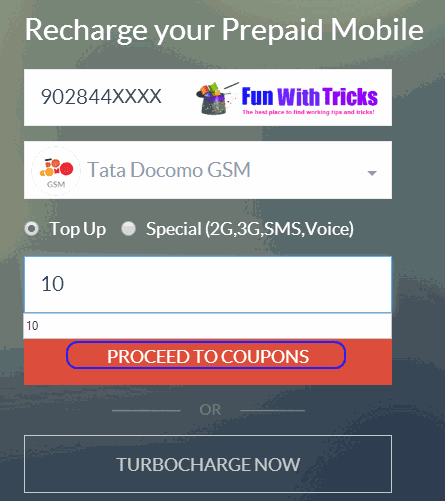 In order to get free coupon codes, you need to do a small recharge on your number. 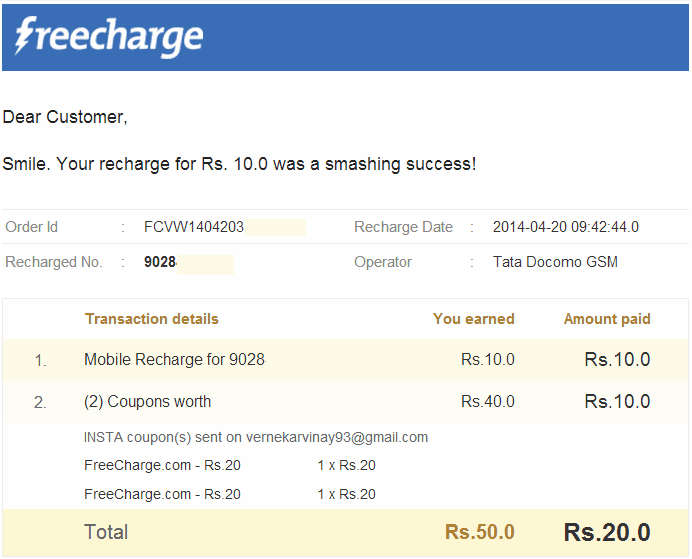 Simply fill your mobile number and a small recharge amount like say 10 Rs. Click on "Proceed To Coupons". 3. 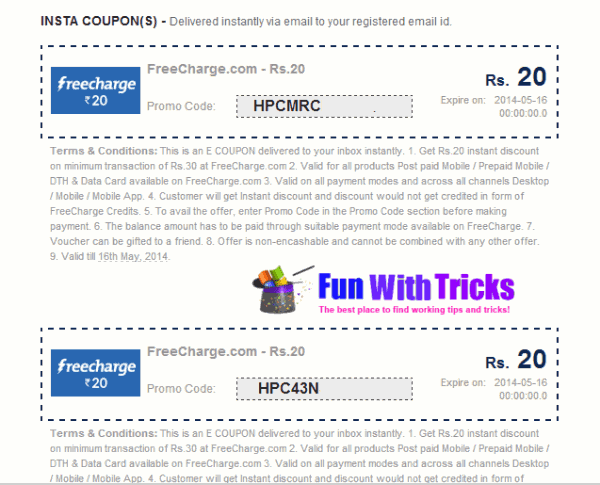 Choose "FreeCharge 20" coupon code and click two times to get two coupon codes for free. 4. Proceed to recharge. Create an account or simply login with your existing account. 5. Pay with debit card for your first recharge. 6. After successful recharge, Check your mailbox for coupon codes. 7. This time you need to do the recharge of more than 30. At the payment page, redeem the coupon code to get 20 Rs. off. 8. You can use one coupon code for only one account. So you need to create another account to get again 20 Rs. off on next recharge. This is a great list, Vinay. Thanks for sharing. 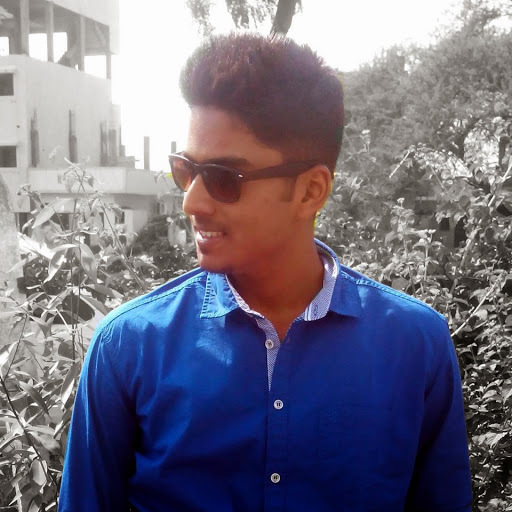 We also have a list on our website http://www.coupondaddy.in/stores/freecharge hope you like it. Thanks.